This chapter deals with the assessment of the quality of a simulation. 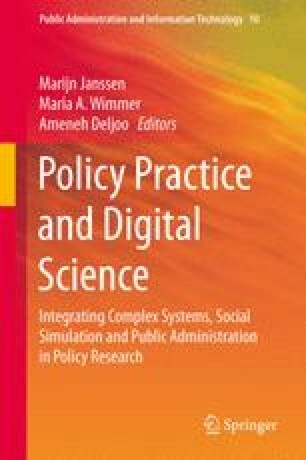 The first section points out the problems of the standard view and the constructivist view in evaluating social simulations. A simulation is good when we get from it what we originally would have liked to get from the target; in this, the evaluation of the simulation is guided by the expectations, anticipations, and experience of the community that uses it. This makes the user community view the most promising mechanism to assess the quality of a policy-modelling exercise. The second section looks at a concrete policy-modelling example to test this idea. It shows that the very first negotiation and discussion with the user community to identify their questions is highly user-driven, interactive, and iterative. It requires communicative skills, patience, willingness to compromise on both sides, and motivation to make the formal world of modellers and the narrative world of practical policy making meet. Often, the user community is involved in providing data for calibrating the model. It is not an easy issue to confirm the existence, quality, and availability of data and check for formats and database requirements. As the quality of the simulation in the eyes of the user will very much depend on the quality of the informing data and the quality of the model calibration, much time and effort need to be spent in coordinating this issue with the user community. Last but not least, the user community has to check the validity of simulation results and has to believe in their quality. Users have to be enabled to understand the model, to agree with its processes and ways to produce results, to judge similarity between empirical and simulated data, etc. Although the user community view might be the most promising, it is the most work-intensive mechanism to assess the quality of a simulation. Summarising, to trust the quality of a simulation means to trust the process that produced its results. This process includes not only the design and construction of the simulation model itself but also the whole interaction between stakeholders, study team, model, and findings. This chapter deals with the assessment of the quality of a simulation. After discussing this issue on a general level, we apply and test the assessment mechanisms using an example from policy modelling.